(Nanowerk News) In an article published in Optics Express ("Determination of the quasi-TE mode (in-plane) graphene linear absorption coefficient via integration with silicon-on-insulator racetrack cavity resonators"), scientists from The University of Manchester describe how graphene can be wrapped around a silicon wire, or waveguide, and modify the transmission of light through it. Graphene biochemical sensors could become reality. Just as information can be carried by electrons in metal wires in a microchip, photons of light can carry information through silicon waveguides to form a photonic microchip. Photonic microchips are often regarded as the future of computer processing and telecommunications because of the vastly increased speeds of operation and bandwidth enhancements. Perhaps more surprisingly, they are also finding applications as highly sensitive bio-chemical sensor devices. In this work led by University of Manchester scientists Dr Aravind Vijayaraghavan and Dr Iain Crowe in collaboration with scientists from University of Southampton, graphene coatings have been applied to what are known as ‘racetrack resonators’ – waveguide loops shaped like oval racetracks – to form a potentially novel device architecture. Dr Vijayaraghavan explains: “When light travels around such a racetrack, some of the light ‘leaks’ out of the waveguide surface, and this ‘evanescent field’ can be used for chemical sensing applications. 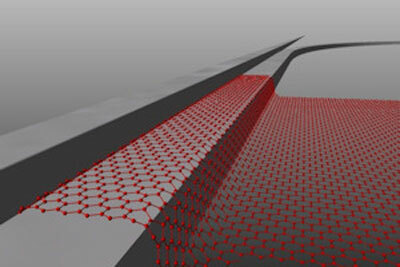 A coating of graphene on the surface of a waveguide can be used to add further capability to such a sensor, such as making it more sensitive and selective. Dr Crowe added: “The addition of the graphene layer to our silicon waveguide dramatically alters the way the light is guided through the device meaning that the light will interact even more strongly with surface deposited molecules, when employed in a sensor device. "This strong interaction between the light and the graphene layer means that the device could also be used to improve the detection of light itself, at very low levels and across a broad range of frequencies when employed in a device known as a ‘photo-detector’.